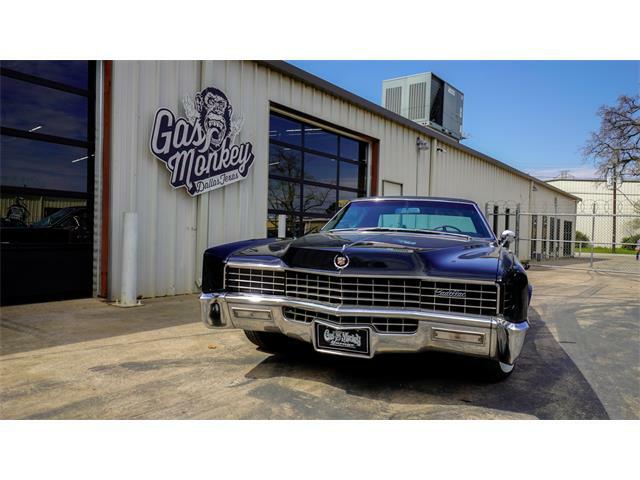 I have been secretly admiring 1960s Cadillac convertibles for several years and wanted to add one to my small collection of classic cars. 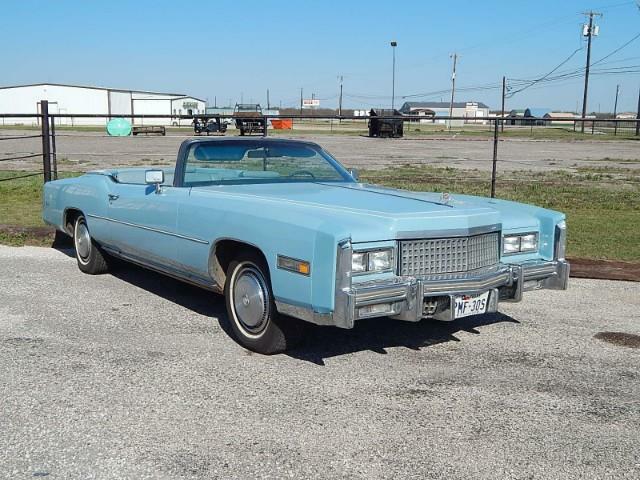 I started searching in earnest in March and quickly realized I needed to find an Eldorado convertible. You see, I have this affliction that if I don’t have the top-of-the-line this or that, I will keep yearning it, even if I have something close. 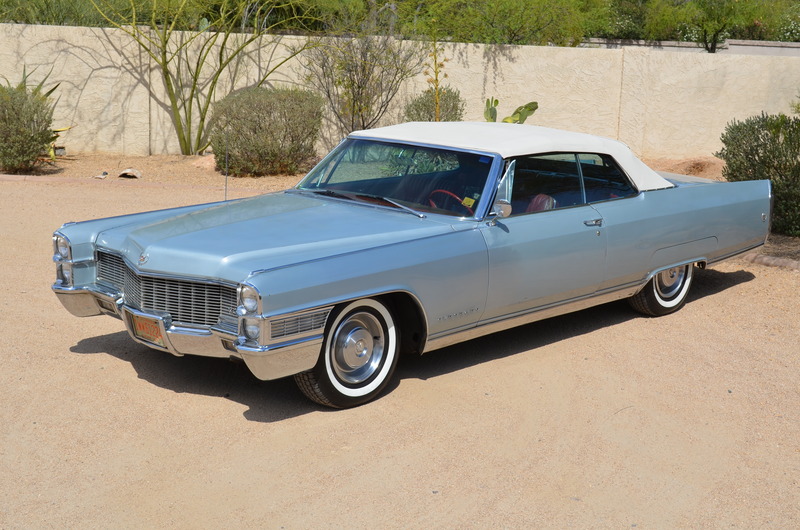 In late April I focused my search on 1965 through 1966 Eldorado convertibles. 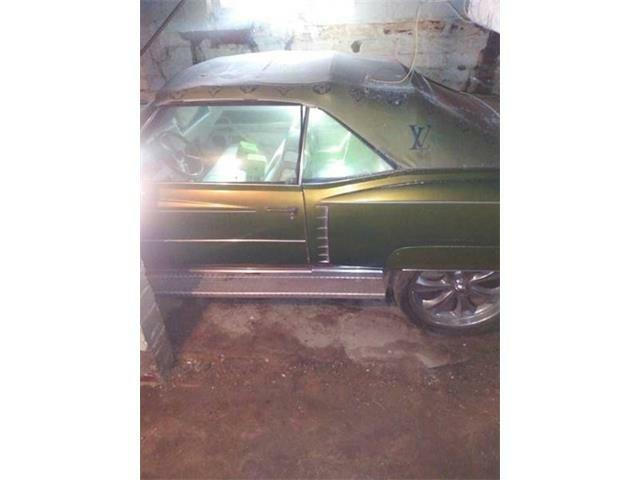 I relied on eBay Motors, ClassicCars.com, Hemmings and AutoTraderClassics.com. 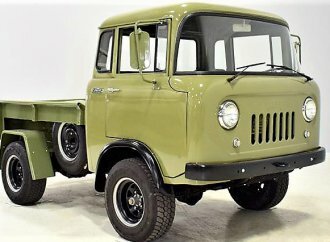 I found a nice 1966 for sale at the Auctions America auction in Auburn, Indiana, and a 1965 being sold by McPherson College in Kansas. My budget necessitated that I find a No. 3 car (good condition) and quickly realized that I couldn’t afford anything better. 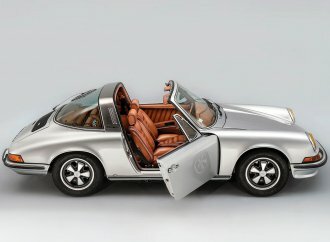 The two I found were pretty similar, both a light silver blue metallic with white convertible tops, the ’65 with red leather and the ’66 with white. I have a special connection with McPherson College that dates back many years. First, as an active member of the American Bugatti Club, we’ve been electing to continue to fund an annual scholarship to McPherson’s restoration program. 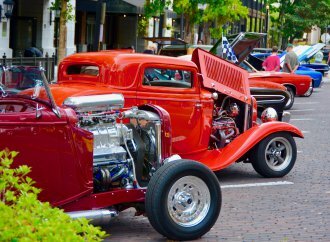 More recently, a consulting client of mine, Road-Ready Certified, relied on McPherson to help develop a classic car pre-purchase inspection criteria allowing me to meet with McPherson program administrators several times. 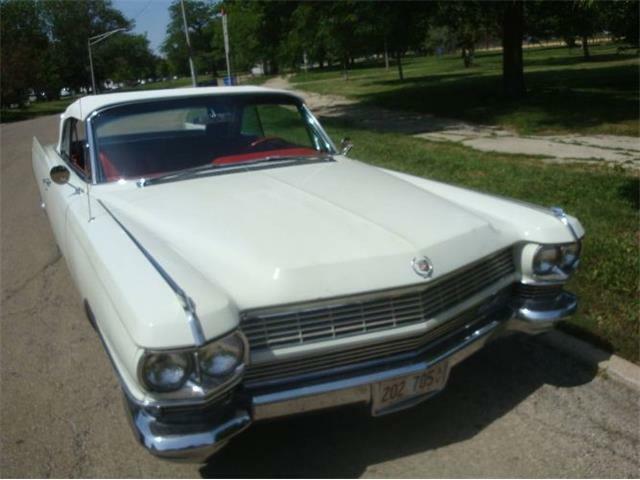 The 1965 Eldorado was being sold by a member of the McPherson staff on behalf of one of the college’s board of trustees. 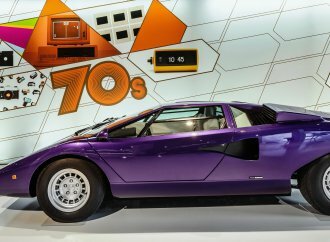 It was being represented as a one-owner car that was much loved all of its life. The staff member, Brian Martin, was kind enough to take several phone calls of questions and made the one-hour drive from McPherson to Wichita, where the car was located, to help answer some of my questions about its condition. His responses were thorough enough for me to develop a restoration/preservation plan and costs estimate. Because I am a romantic and love the histories related to old cars, I was comfortable making an offer, which was ultimately accepted. I have to say that it was a delight working with Brian over the cost estimates and the plan details because he is a professional. It made it easy for us to get onto the same page for values. 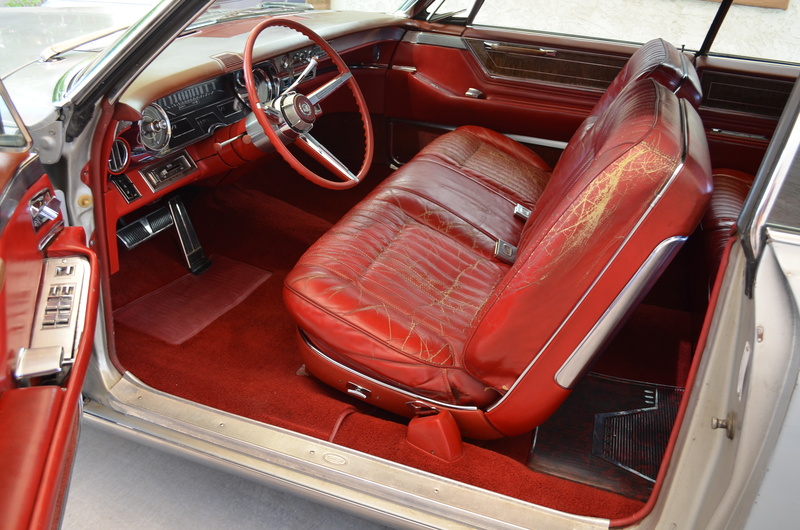 The 1966 Eldorado was at auction selling two days later. I listened in as a phone bidder but never made a bid. My thinking was that if it sold very cheaply I would buy it, but I would not otherwise be interested. The 1966 ended up exceeding the price I was willing to pay so I passed on it. Cie La Vie! 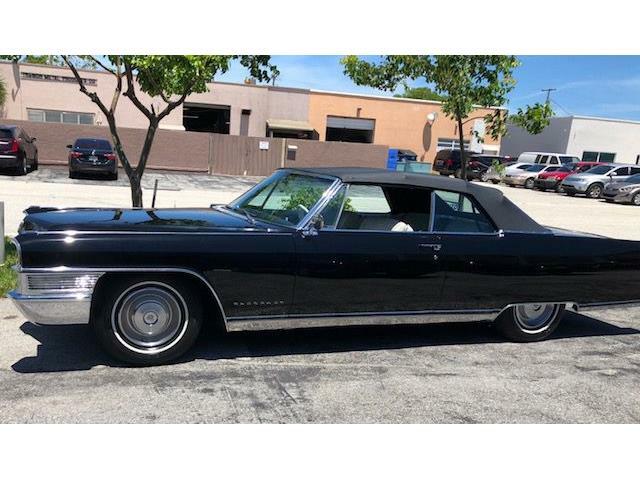 I obtained a quote for shipping the 1965 Eldorado from Wichita to our home at Temecula in SoCal wine country, but was also interested in flying out and driving it back with my 18-year-old son, Craig. I arranged with Brian to have the local mechanic go through the car to ensure that it would be in top shape for the 1,300 mile journey. Luckily, the local Wichita mechanic (Terry at Beard’s 66) had been servicing the car since the late 1970s and had enough time to prep it for the trip. Ten days and about $3,000 later, the Cadillac was completed, so we headed to the airport and flew to Wichita. We called the sellers and met them at Beard’s 66 and followed them to a charming restaurant nearby called Piccadilly’s. Patrick (Pat) and Bunny Hill were a delight the instant we met them. They were engaging and very full of life. The car was bought new in Miami by Pat’s mother, Evelyn Hill. Pat was the very first to say that his mother was quite the character. She was raised in New York by a very successful self-made man. He made his fortunes building thousands of homes for the Endicott coal miners in Pennsylvania. She was his favorite thing and raised her to be quite the pistol. When she got into a little bit of trouble he thought it was funny, which made for a very colorful and dynamic adult. Evelyn raced cars, belonged to country clubs, enjoyed her gin and tonics and smoked cigarettes. She also had quite a vocabulary which frequently included language as colorful as herself. She was also quite the player, having had five husbands and dating many notable people, including dukes and dignitaries from around the world. She was a long-time member of The Jockey Club of Miami (the Eldorado still bears the window decals of her membership). 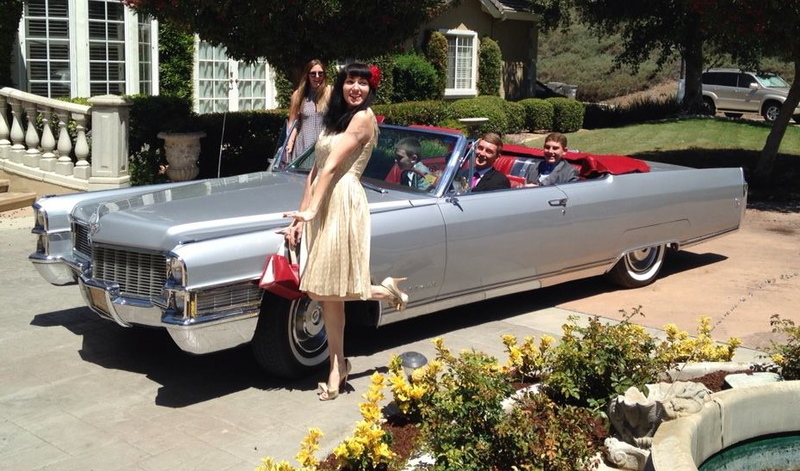 She evidently drove the Eldorado in a very spirited manner, but luckily never had an accident. 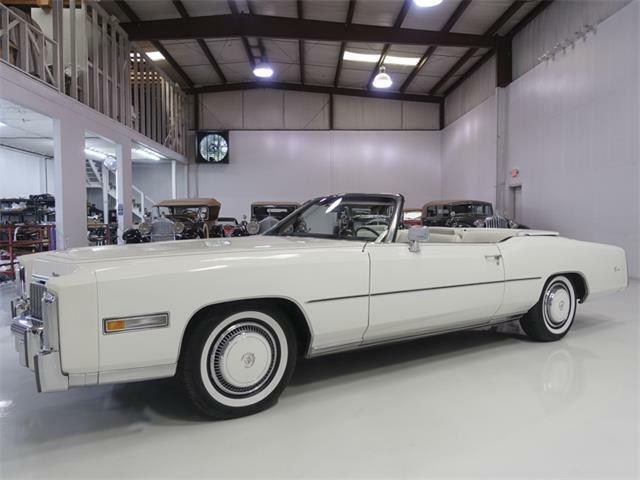 Pat recounted that his mother went to the Miami Cadillac dealer and fell in love with the flashy Eldorado convertible and somehow managed to buy it out from under a basketball player who also wanted it. Luckily, her two-bedroom home in elegant Coral Gables had a one-car garage. 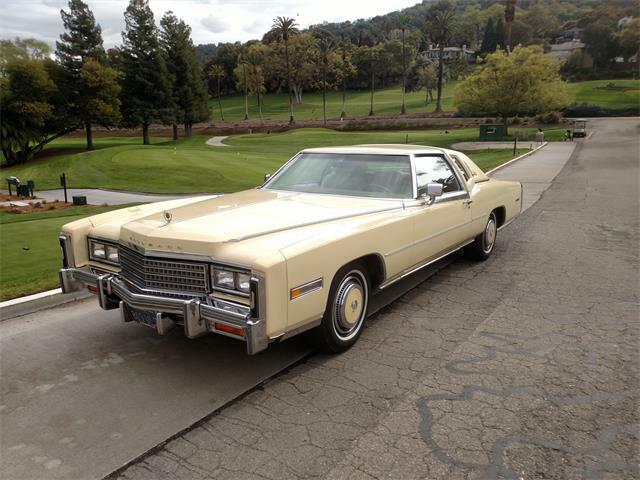 The Eldorado was never left out in the elements and was always garaged. The car saw little highway use. It was used mainly for driving around town and to the club. By 1975 Pat had married Bunny and they had their first child. Pat and Bunny met at McPherson College and settled in Wichita where Pat took over an advertising agency. Evelyn wanted to be near her first grandchild and decided to move to Wichita. 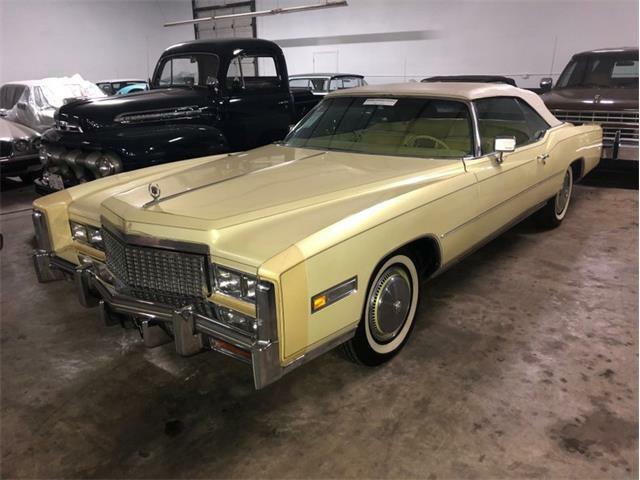 She sold her home in Florida, bought a house a half block away from her new grandchild and had the Eldorado shipped to Wichita because she didn’t want to add miles to the car. 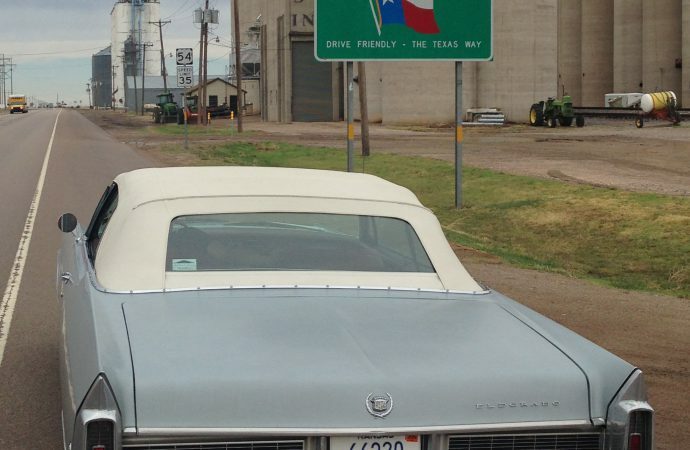 She continued to use the Eldorado as her daily driver until her death in 2007. Pat and Bunny inherited the car and kept it in good repair but used it little (one of Evelyn’s last requests was that they take good care of the Eldorado). Fast forward to the adventure of driving the car home, our primary home near Phoenix. Craig and I had an uneventful flight to Wichita, had the delightful dinner meeting Pat and Bunny and heard the history of Evelyn, the Eldorado and other fascinating stories. After dinner we decided to get a couple of hours of the trip behind us. We left at close to 9 p.m. in rain and made it about 150 miles to famous Dodge City, home to Wyatt Earp, Boot Hill and a few notorious outlaws. We were very pleased and fortunate for the new American Classic radials from Coker and new modern windshield wipers installed by Beard’s 66. The big Eldorado handled true and steady through all the weather. We heard many jokes about western Kansas. It certainly lacks any significant variety of sites, perhaps with the exception of the recent addition of the large modern white windmill farms. It was interesting to see the large number of deserted farmhouses, windmills and barns that whispered the 1920’s migration of the Dust Bowl survivors. And these scenes are in the foreground of the massive agribusiness factories that are strewn throughout western Kansas and into the panhandle of Oklahoma and Texas. By the time we made it to New Mexico the scenery became markedly more natural, beautiful and varied. 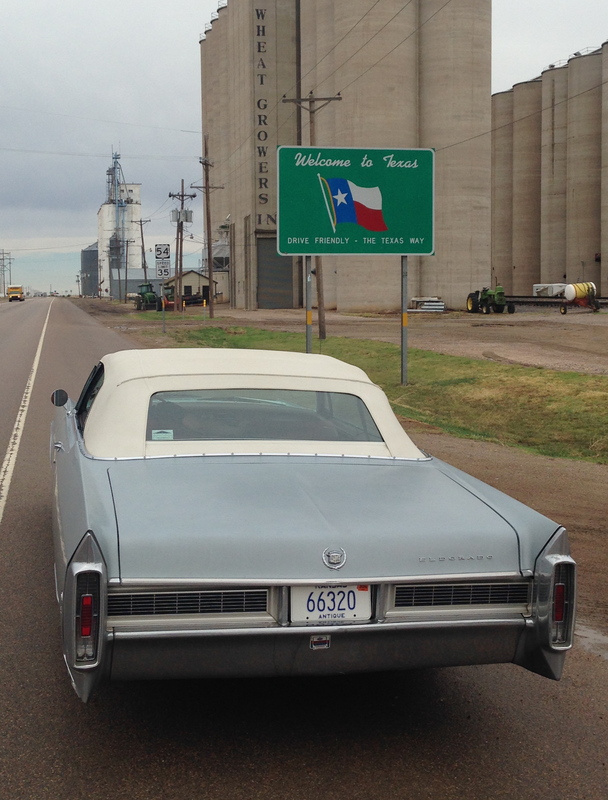 For about 800 miles we had intermittent rain and no mechanical issues with the Eldorado. We stopped for dinner at Jerry’s Café in Gallup. It is a popular locals-only Mexican-American café with fantastic food and pleasant service. The second night was spent in Winslow, Arizona. We had wanted to make it to a highly rated restaurant called the Turquoise Room that was recommended to us by Rich and Penny Post, my soon-to-be in-laws. Craig and I were so full from Jerry’s Café the night before that even the thought of a big breakfast was overwhelming to us. But the other suggestion they gave us was to head home to the Phoenix area through picturesque Route 87 rather than the freeway. It is a gorgeous single-lane road that winds its way through the mountains covered with pine trees and spectacular vistas. Craig did most of the driving. Imagine being 17 and driving hundreds of miles in a big car without anti-lock brakes and many other conveniences? Most of the trip we kept the car propelled at between 65 and 80 mph. Unfortunately the cruise control wasn’t working so we needed to be very attentive to the speedometer as the powerful Eldorado would accelerate from 65 to 80 mph as if it had a will of its own and without notice. Craig was shocked at how the Eldorado was so comfortable drinking gasoline like a sailor drinking whiskey. It averaged between 11 and 12 mpg. 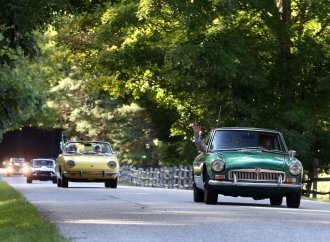 I had anticipated 15 mpg based upon my experiences with long distance tours in my former 1947 Packard and 1964 Rolls Royce. 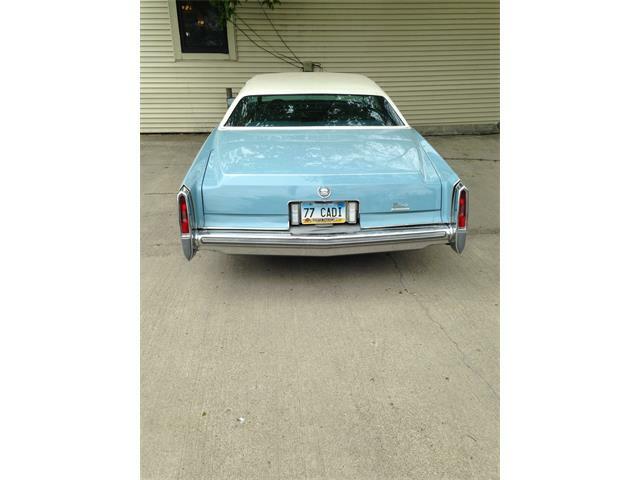 I was pleased that the Eldorado needed only one quart of oil after about 900 miles. One week after arriving in Paradise Valley, Arizona, we set out on the final leg of the journey to our Temecula house. My finance and I were getting married in three weeks at our Temecula home and we needed to spruce up the yard and, of course, a couple of our cars in preparation for The Big Day. We left Paradise Valley by 5:00 a.m. for the six-hour drive. 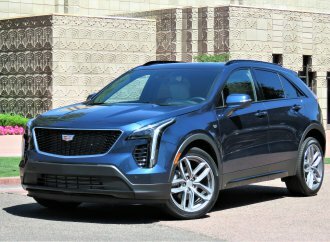 As you would guess, the late mornings and afternoons in the Arizona and California deserts are brutally hot, which is hard on the old cars as well as us drivers. The car made it perfectly fine with the maximum air temperatures peaking at about 98 F by the time we drove through Palm Springs. 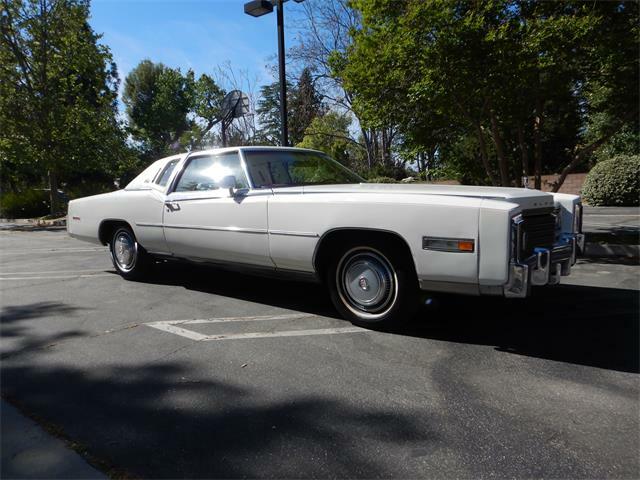 When we arrived in Temecula, I dropped the Eldorado off at a restoration shop to have the air-conditioning repaired and valve covers painted. After the air-conditioning was fixed I had arranged for a painter to pick the car up and perform a full repaint within the two weeks remaining before the wedding. I really wanted the Eldorado there for the wedding and I wanted it looking as close as possible to its former glory. I found a very qualified painter who does many hot rods. I was quite worried at first — a full repaint of nice quality in two weeks? The owner of the shop, Pete, was confident that it would all be fine and exuded enough confidence that I proceeded. Within one day the car was substantially fully blocked sanded, many dents removed and the trim removed from most of the car. I started to relax a bit after seeing the energy invested in making it happen on time while doing a nice job. I ordered new door and trunk seals, sending them directly to Pete’s shop. The seals showed up just in time for the car to look nearly new in time for the wedding.